As I’ve mentioned in a previous list, funny things end up on your plate sometimes when you’re travelling. And sometimes you see an odd-looking fruit in the market that you can’t resist picking up even though you have no idea what it is, how it tastes, or how to eat it. 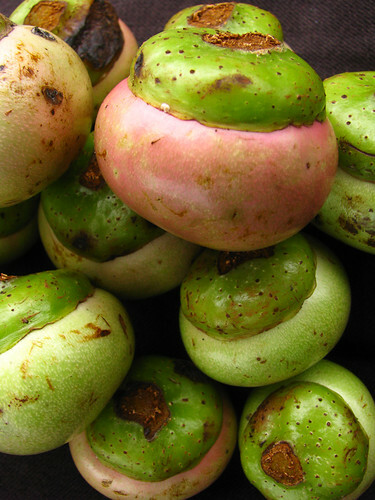 The eleventh article in the World Tour Highlights series lists, in alphabetical order, some of the exotic fruit we’ve come across in our travels. The places in brackets for each fruit are where we first ate it or encountered it, not necessarily the places where it grows. Breadfruit grows practically everywhere in the tropics, though I first ate it in Fiji. It’s a round, knobbly green fruit, about the size of a big grapefruit, with a funny fibrous texture inside. It’s a starchy staple food, eaten boiled or fried. The taste and texture is a lot like a root vegetable. 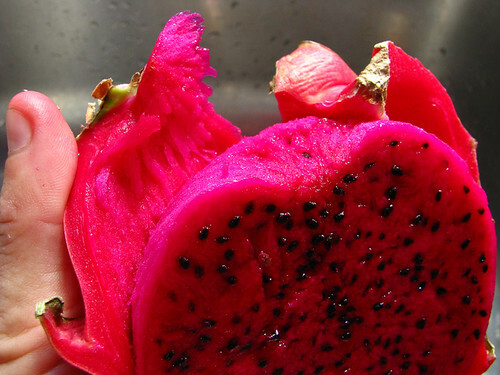 We must have eaten hundreds of dragon fruit during our two month stay in the town of Kuching, in Malaysian Borneo. It’s a cactus fruit with bright fuschia-red rubbery skin that has leathery scales curling away from it. The flesh is mild, sweet and melon-like with tiny black crunchy seeds all through. There are red-fleshed and white-fleshed varieties. The red, with drippy beetroot-coloured juice that stains everything, are much better than the white. I miss them. Durian is called the King of Fruits, but not by me. It’s a huge delicacy in Malaysia and Indonesia. Durian season in Borneo coincided with our last couple of weeks in Southeast Asia, and the streets and markets were full of their unmistakable stench. The smell is so pungent and stomach-turning that lots of buildings and buses prominently display a No Durian Fruit sign. People kept telling me that it’s an acquired taste, that they taste much better than they smell, and that I shouldn’t judge until I’d tried their particular favourite variety. 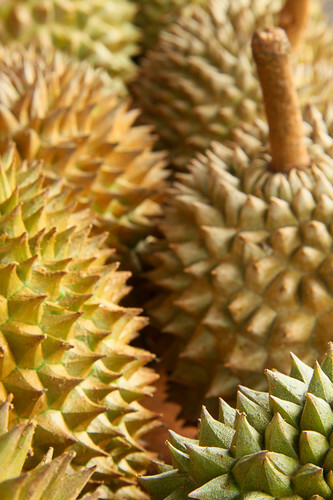 I tried a few, but though I did eventually get used to the smell - even developing a certain fondness for it - the taste always made me gag, and there’s no way in hell I’m ever putting durian fruit in my mouth again. I remember sitting in a ferry from Brunei to Pulau Labuan in Sabah with somebody else’s box of durian between my feet, and wondering if my nausea was due to the rough sea, the durian or the gory Thai martial-arts movie being shown. Probably all three. A strange fruit like a squashy green-white acorn with a leathery green cap. Ready to eat when it turns red; not to be eaten before that or your tongue will fall off, according to a cleaning lady we met in Bandar Seri Begawan in Brunei. At least, that’s what she claimed her mother always said. We bought half a kilo in the market in Miri on Borneo just because they looked so interesting. Sheryl ate an unripe one and said that her throat and the base of her tongue prickled and burned uncomfortably for hours afterward, so maybe there’s some truth to the old wives’ tale. A green fruit about the size and shape of an egg, white inside with a tomato-like texture. The flesh smells and tastes very strongly of cheap perfume. Native to South America but grown all over New Zealand. I didn’t like it much, but I didn’t hate it either. 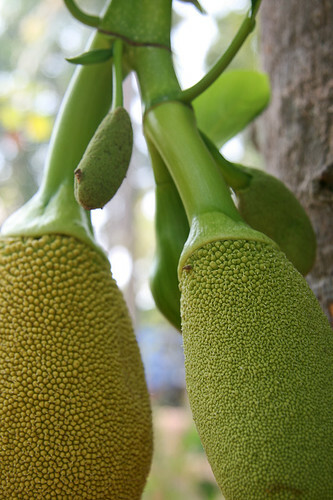 A massive, heavy green fruit that grows directly from the trunk of its tree. Densely covered in short thorny points. The blobs of flesh inside are rubbery and firm and taste a bit like banana custard. We first saw this in India, but I don’t think we actually ate any until we got to Malaysia. Like a tiny, oval mandarin or clementine, with a sour, acidic, citrus taste. It grows all over, but I only really ate it in Fiji. I just love the name kumquat, it’s fun to say. Round fruit with a pebbled skin, much like lychees. The flesh is similar, too. When you take the shell off, the black seed inside the white flesh makes the fruit look like an eyeball - in Malaysia they called them mata kucing, cat’s eyes. The Queen of Fruits. Impossible to get outside Southeast Asia because they don’t ship well. A squash-ball sized hard purple fruit with four green leaves like a persimmon. Crack it open gently and the white pulpy segments inside look and feel like lychee flesh and taste like a strawberry pineapple. My very favourite fruit in the world. 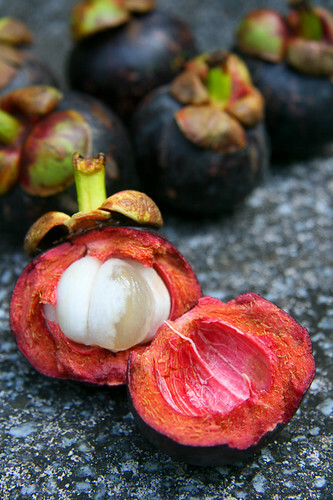 We were lucky to be in Borneo during mangosteen season. I must have eaten a thousand of them. 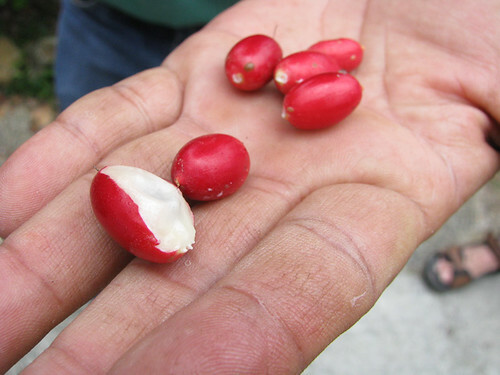 A strange little red berry without much of a taste in itself, but that has the curious property of making everything taste sweet for an hour after eating it - even sour or bitter fruit tastes sweet after eating a miracle fruit. I didn’t believe it before I tried it, but it’s true. I wasn’t much of a fan of passionfruit. It’s slimy and I don’t like the taste or the smell. But Sheryl loves it and so there were always some around. 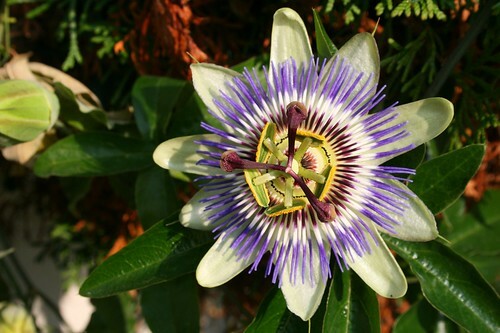 And their amazing flowers make up for the nasty fruit. Like a huge yellow-green grapefruit with pebbled skin. It tastes like a less-sour grapefruit, too. They’re so big that we never bought them, but only ate them when it was offered. Red, orange or yellow fruit like lychees or longans, but covered in long, soft spines like messy hair. Sold in bunches still on the branch, like longans or grapes. There’s always a big pile of rambutans in the markets of Southeast Asia. 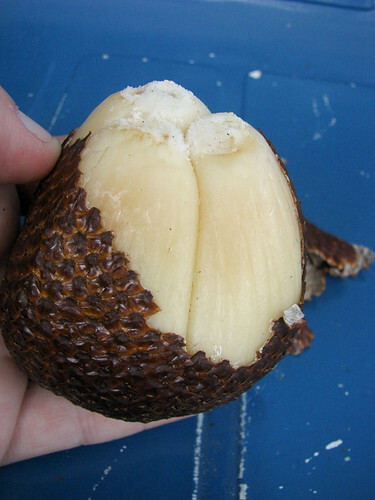 Called snake-fruit for its hard, scaly green-brown skin. The off-white flesh is hard and crunchy and has a strange bitter-acid-sweet taste that made my tongue wrinkle up and dry out. Another one of those fruits we bought in a market because we thought it looked neat. 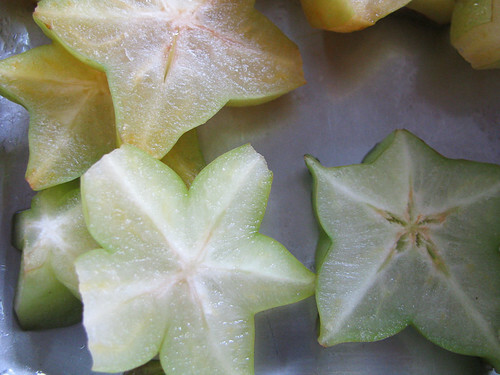 Yellow-green fruit with big ridges running lengthwise so that it looks like a star in cross-section, which is how it’s always cut to be served. Tastes like mild, sweet citrus. Very juicy flesh like a grape. Seen in markets everywhere in Southeast Asia. We ate it from time to time. Hey, don’t insult my precious mangosteen! Now I really want some mangosteen and dragon fruit :). Mangosteens in Canada just aren’t the same.